My pal Sniz had a great post on her site that got me thinking about a website (and the source) I used to frequent a lot and I sort of forgot about. 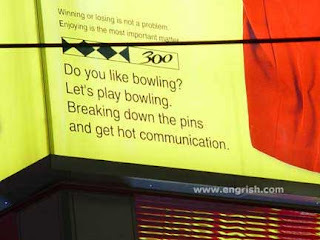 It’s Engrish.com and it’s probably one of the most endearing sites ever. Anyway, check it out. It took some searching, but I found my favorite. Dig it. Is there any other kind of communication? I love engrish.com. I’m the one who introduced the Mrs. (aka “Miss Sniz”) to it. I also love having more blogs to visit written by men. I’ll be stopping by more often.